Born in Moose Jaw, Saskatchewan, Davis began his newspaper career in his hometown with the Herald and then spent five years with the Regina Leader Post. He then went to the Chatham Daily News before joining the Winnipeg Free Press in 1968. 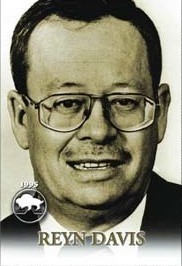 Reyn Davis covered the Winnipeg Junior Jets from 1969 and then the professional Jets of both the World Hockey Association and the National Hockey League from 1972 to 1987. He was also named to the Manitoba Sportswriters and Sportscasters Association Media Roll of Honour.